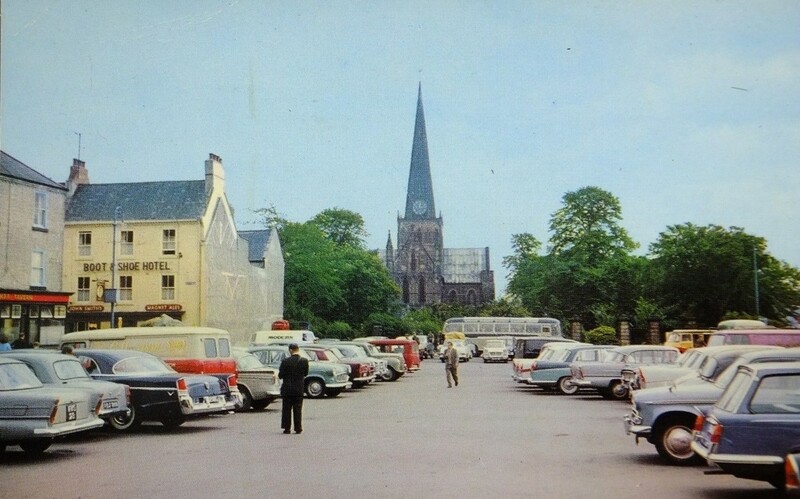 This is Darlington in the early sixties. It can’t be before April 1961 because that’s when the Triumph Herald estate was launched and there’s one on the right, but it can’t be much later since the Austin Mini was launched in 1959 and there isn’t one in evidence and you would expect to see one I think. Anyway, for the early sixties it’s what you’d expect. An assortment of British cars, the larger of them trying to look American with their little rear fins. On the right we have the Triumph Herald estate. But there on the left in Darlington market square is the real thing. The huge, preposterous, two door, 1956 Chrysler Windsor. Maybe it is so well proportioned that it doesn’t look so long, but it was. A whole 18 ft 4 inches and 6 ft 7 inches wide. For comparison that Herald is 12 ft 9 inches long by 5 ft wide. It looks heavy and bulbous. The bonnet, like we were so used to seeing in British cars of the fifties (and on the Morris Minor up until 1971) was moulded and higher in the centre than where it met the wings. And the wings, front and rear, although part of the body, seemed separate. And it was tall. A high car. For the 1956 model year Chrysler employed a designer rather than an engineer, one Virgil Exner, to give their range a new look. Exner called that look The Forward Look and what he aimed at was clean simple lines and a lower car. Darlington, County Durham. Darlington, South Carolina. But what’s it doing in Darlington in the North East of England in the early sixties? I like to think that its American owner, an American serviceman maybe, saw the name Darlington somewhere and did a double take. For it was at Darlington Raceway in Darlington, South Carolina in 1956 that “Speedy” Thompson came so close to winning the NASCAR Southern 500 race in a Chrysler. I think perhaps our Windsor owner decided to go and see for himself England’s Darlington. He was lucky to find a parking space big enough. Whatever he thought of the town, I’m sure he appreciated the Boot & Shoe Hotel. If you liked this postcard you might like A New Yorker in St Mawes featuring a Chrysler New Yorker convertible. Or how about Post War Yank Dodges Pedestrians in Llandudno with another huge Chrysler looking out of place, this time in Wales. Good information on the beautiful Chrysler. And what a car it is to find a space between the humble British motors. It must be at least May 1962, seeing a Mk III Ford Zephyr 4 on both sides. On the left a maroon one, four spaces behind the Chrysler. The high radiator grille could disclose the other one, hiding between the ’60 Vauxhall Victor and Austin A55 Cambridge. Trees are glorious green, so let’s make it June 1962! Is that black-costumed man writing a fine for the proud Windsor’s owner?